I arrived in Buenos Aires with huge expectations. My friends have said it was the most beautiful city in the world. I landed at EZE airport coming from Santa Cruz. 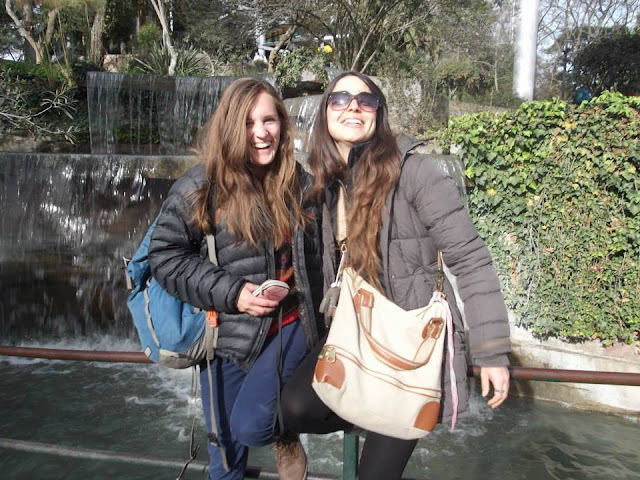 My friend Soledad picked me up... and thus began a whirlwind adventure of Argentina. 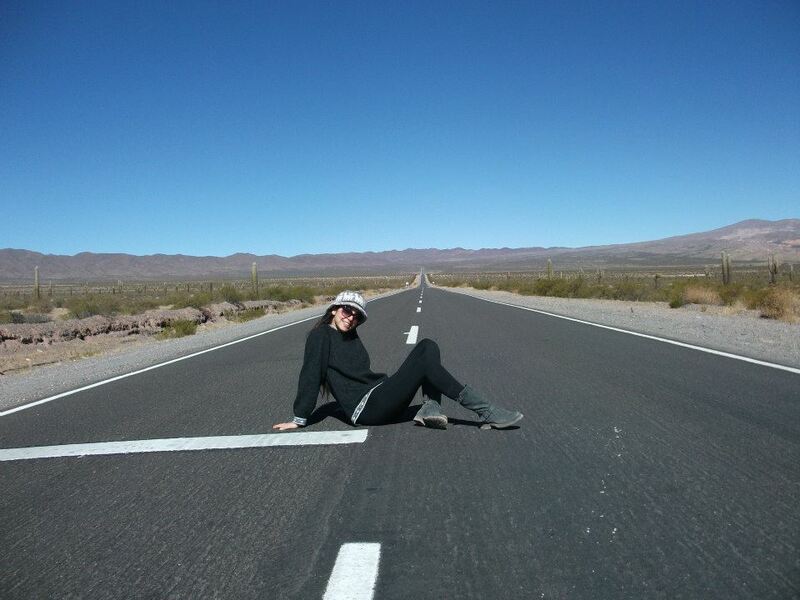 We had decided to do something fun and adventurous for the week I was staying in Argentina. We had no idea what we were going to do. Argentina is such a big country and there are some many places to visit. Salta since Soledad has never been, but flights were very expensive. Driving up to Salta takes two days, so we were a little weary about driving so far. After a long disscuion we decided to drive to Salta, despise the long distance. We are very glad we made that discision. With only one night to get ready for the trip we headed to bed at 1am only to get up at 5am to start driving. Our first leg of the trip was a grueling 715km (445miles). 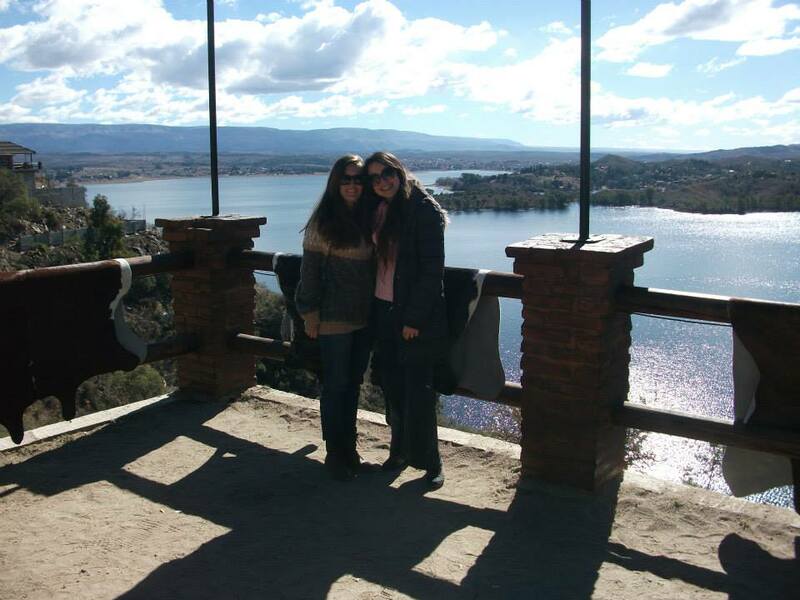 Much of the drive was farm land, until we got to Embalse Rio Tercero. This lake literally popped out of nowhere. It was beautiful sparkling lake surrounded by small little villages. We stopped on the side of the road to buy smoked cheese, sausage and some bread to snack on. Out first night was Villa General Belgrano. This small town is know for its German influence, it hosts Oktoberfest each year. The town is full of souvenir shops and restaurants. We stayed at a El Rincon hostel, which was as the name suggests at the rincon (corner) of the town. Despite its distance from the center it was a peaceful place hidden in a forested area. We arrived earlier than expected thanks to Sole's crazy driving (I am joking she is a very good driver). 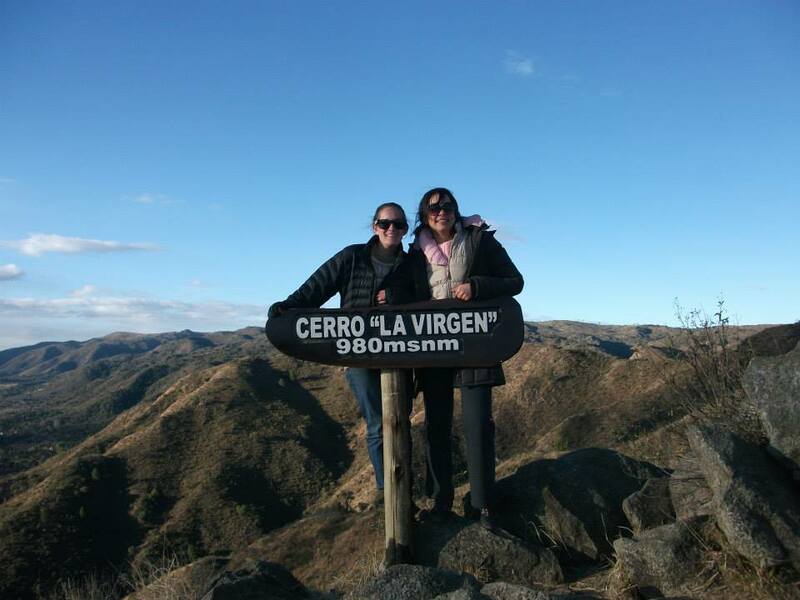 Sole and I walked down town and then up to Cerro El Virgen. Although it says it takes an hour to climb up from the entrance, it only took us 30mins. We enjoyed mate and the view of the town. Although we started up late, we made it back to town before the sun went down. We looked around town and then went out for dinner where we had amazing ravioli filled with squash. I tried for the first time Ferrnet with Coke, which is a popular drink in Argentina. 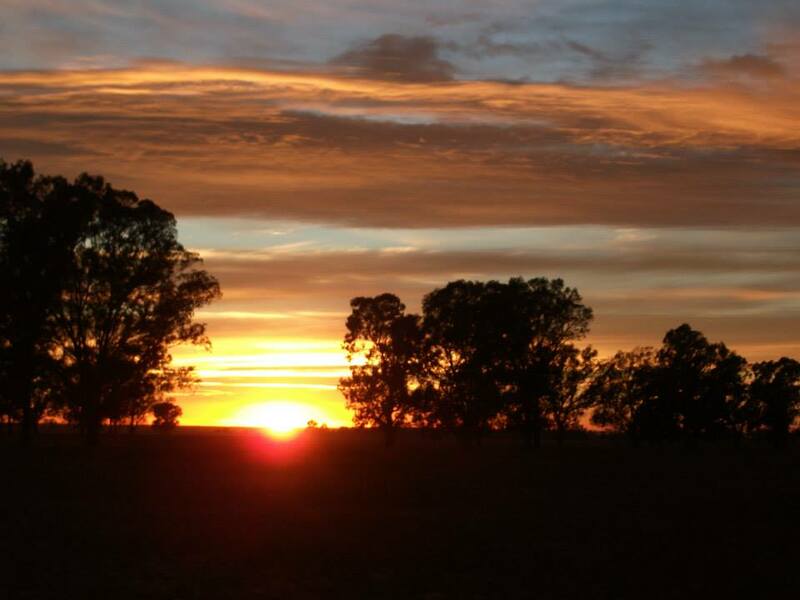 We woke up early the next day to drive to Cachi in Tucuman along Routa 40. Along the way we stopped in Tafi del Valle for lunch on the side of the road. Tafi del Valle is a small town on the edge of a lake sourrounded by mountains. From Tafi del Valle we headed through Cafayate, a pueblo known for its wine. We stopped anywhere we thought looked pretty to take pictures and enjoy the view. 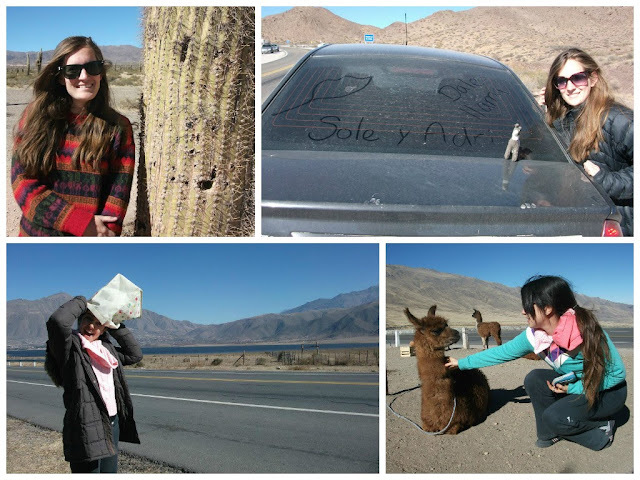 Along the way we met a llama, attempted to take pictures of horses that were just running along side the road (they were scared of us), we took pictures of us driving across narrow bridges and with giant cacti. From Cafayate we headed for Cachi along Routa 40 which at this point is a dirt road. Driving less than 30km/hr, it began getting dark before we knew it. The road was only wide enough for one car, there were no lights, except those of our car. We were the only ones for miles. Sole thought that it was a good idea to scare me by turning off the car lights while still driving... Other than the fact that I was terrified for those few seconds, the stars were amazing. Just imagine being in the middle of nowhere, high altitude and no lights. 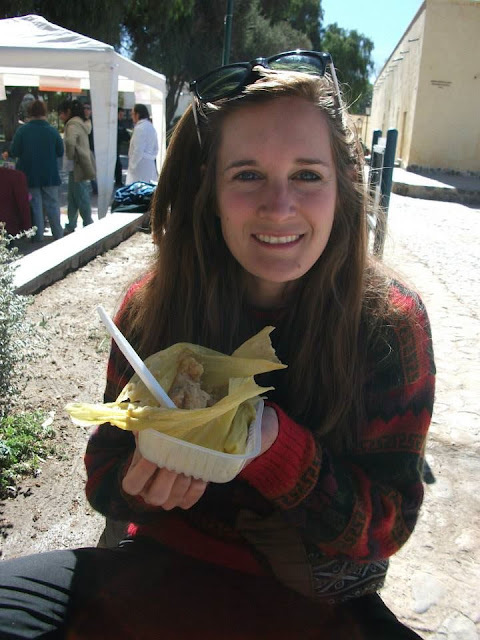 We decided instead of driving all the way to Cachi we would stop in Los Molinos. Los Molinos is 50km before Cachi. 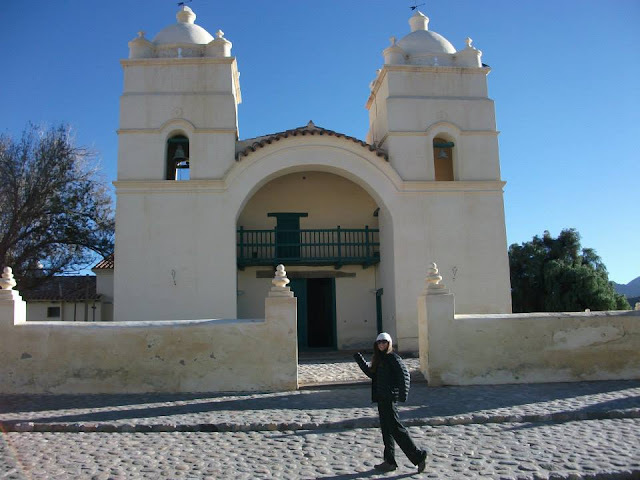 Its a small pueblo with two restaurants and an old church. We found a small guest house run by a mom and daughter. We stayed for 85 pesos including breakfast. We put on the warmest cloths that we had and headed out into the freezing cold night for dinner around 9:30pm (resurants don't open until late since Argentinos don't eat until late). For 30 pesos we had chicken, salad and a meat empanada. We went back to the house to sleep after a long day of driving. to our original destination, Cachi. It turned out to be a top and marble competition in the square. We walked around eating empanadas and humita (which is a South American variation of a tamale) watching kids playing with tops and marbles. From Cachi we headed to Parque National de Cordales. It was like a forest of cati. 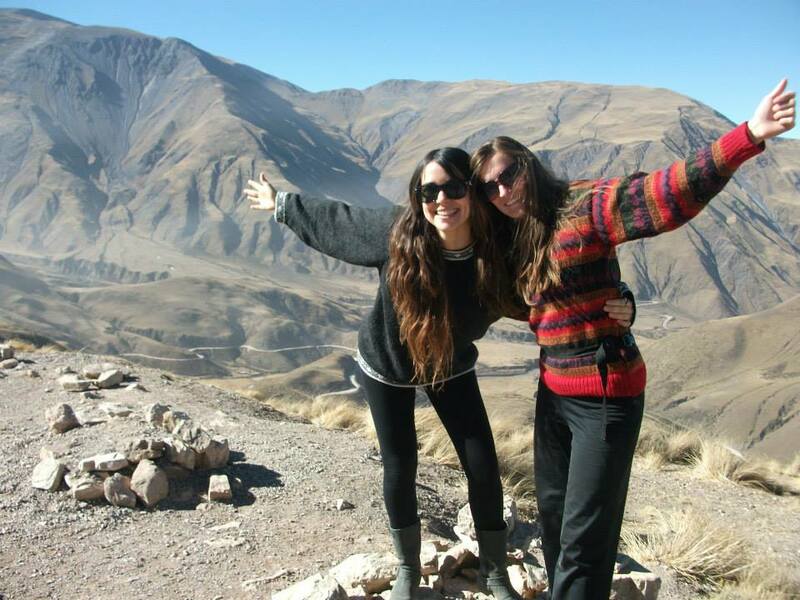 After some quick pictures we drove on through the mountains to Salta. This is the day I learned to drive stick-shift. It was hard enough to drive stick shift, add driving in another country and narrow dirt mountain roads...Good news I did not crash. We arrived in Salta early, despite my terrible driving. We found a hostel near the center and headed out to a peña. A peña is a a restaurant/show. As you eat local food you are entertained by a live band and traditional folkloric dance. After a whole bottle of wine shared between us both we headed out to dance with a couple of the waiters at the restaurant. El Salon is a medium size dance club in Salta. Its popular on Wednesday nights and starts getting busy around 2am. In Salta the discotecas alternate nights, one club is more popular than the other on certain days, so if you are planning to go out dancing in Salta, check which club is popular that night. We headed home around 5:30am and woke up the next day at 7am to go horseback riding for 3 hours in San Lorenzo (a small pueblo outside of Salta). Horseback riding costs 200 pesos a person. It was a nice ride through the fields of San Lorenzo in a small group. We made friends with the gaucho, who decided to intruduce us to the best dinner spot in town. 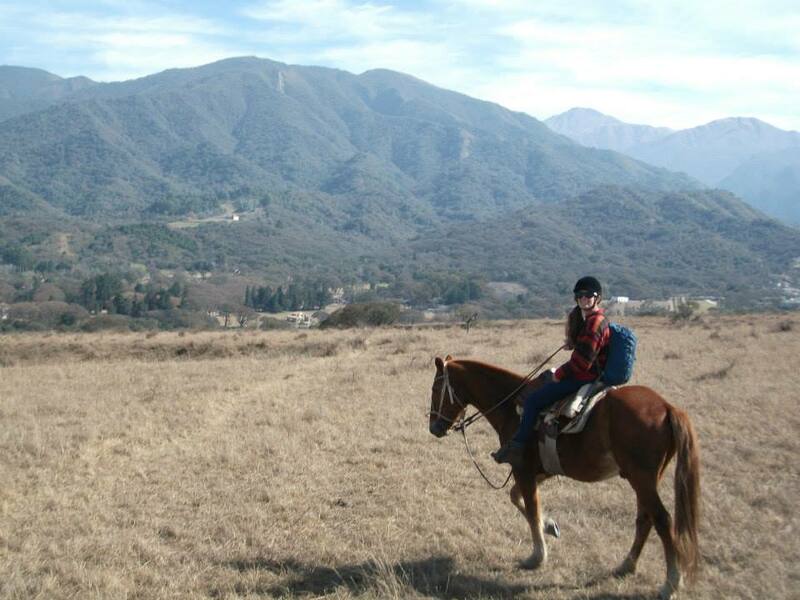 After horseback riding we explored San Lorenzo and headed back to Salta. In Salta we took the gondola up to Cerro San Bernardo for views of the city. After the gondola ride back we visited the cities majestic churches and headed to the square. 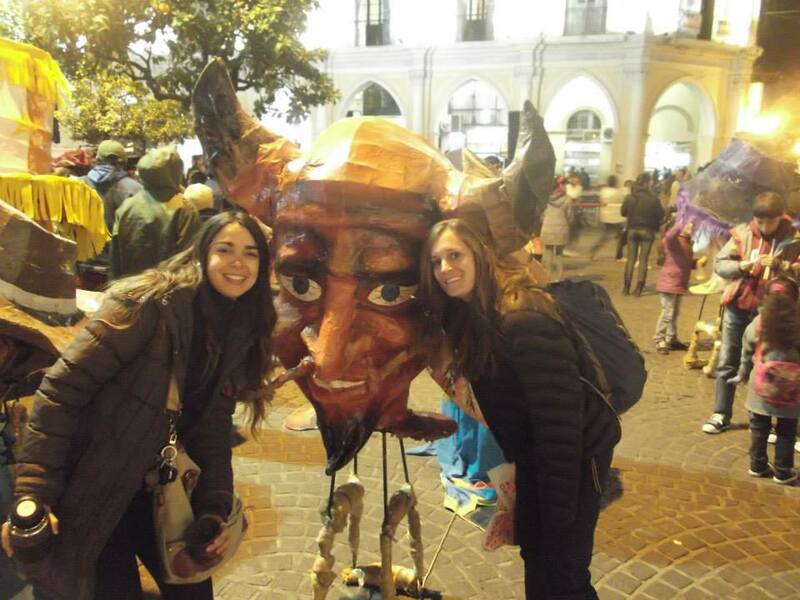 We were surprised to find out we had come right in time for Festival del Inviero. We watched people in masks and dancers parade down the street. After we were completely frozen the gauchos picked us up and we headed to La Casona del Molino restaurant for some meat and sangria.I highly recommend going here, if you can find a place to sit. Its a huge restaurant with many different rooms, outdoor seating and lots of very Argentinian dishes. The next morning we woke up with a food hangover and began our return back to Buenos Aires. Our first leg was from Salta to Mina Clavero. Here we enjoyed cafe con leche, talking and photo sharing. After coffee we headed to an Italian restaurant for ravioli, lasagna and wine. We headed to bed and woke up before the sun came out to start our last leg of the trip to Buenos Aires. As we climbed the mountains around Mina Clavero we watched the sunrise light up the sky and the rocks around us. We arrived in Buenos Aires around 4pm in time to tour the city before dinner.